story PHIL HESTER art ROMANO MOLENAAR cover A JEREMY HAUN cover B SHELDON MITCHELL CELEBRATE THE FIFTEENTH ANNIVERSARY! 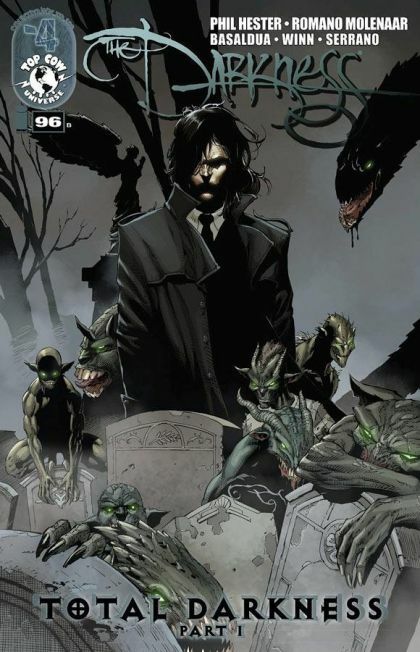 Since The Darkness first debuted fifteen years ago, the Darkness itself and its headstrong bearer, Jackie Estacado, have often been at odds. Estacado is no saint, but the Darkness has crossed a line and to protect his family, Jackie will take the fight into the heart of the Darkness itself. Leading up to the landmark issue #100, long time writer PHIL HESTER (Wonder Woman, Green Hornet) is joined by artist ROMANO MOLENAAR (The Darkness II: Confession) for the stunning conclusion of his three year run! Featuring a variant cover by SHELDON MITCHELL!